From the cab of Union Pacific's DDA40X, we're rolling through Kalispell's industrial area. To mark its centenary in 1969, Union Pacific commissioned the manufacture of a locomotive that would not only celebrate 100 years of the railway but also bring back the spirit of its huge steam locomotives, colloquially referred to as the "Big Boys". Basically the DDA40X is two locomotives built on one chassis frame. It boasts 6600hp and is 30 metres in length. Fifteen or sixteen were built and used in heavy freight work. After their working life was completed, UP donated one to a US rail museum. 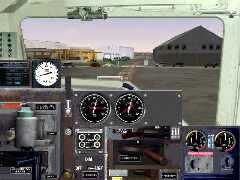 The UP DDA40X is a free download from the Auran site (bear with the free registration process). However, this free download doesn't include sounds or a cabview. Recently, a cabview was posted at Train-Sim.com so we'll work through the steps to give the DDA40X a proper cab. A special UP excursion passes over Two Medicine River on the Marias Pass route. 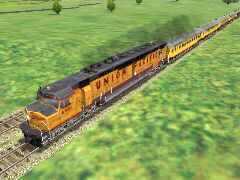 Firstly, you'll need to have downloaded Auran's free demo of the Union Pacific DD40X from the Auran site at www.auran.com/trainz/msts/ (3.6Mb download). Be patient with the registration (it's free) process. emd40snd.zip (17-Nov-01, 2.6Mb): a convenient installer of the SD40 sound set; they're installed into the Common.Snd folder for you so they can be used by other locos (ignore this download if you've already got these sounds). This download supercedes sd40snd2.zip (11-Sep-01). 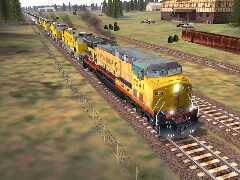 sd_40_x.zip (3Mb, 04-Sep-02) or sd_40_rx.zip (09-Sep-02): EMD engine sounds with between-notch sound - recommended! gp40_snd.zip (22-Jan-01, 3.2Mb): may as well get these too, even though they're not required here. They've got their own install programm and then you've got the main sounds stored in Common.Cab for other locos. This download supercedes sd40snd.zip (23-Jun-01). Once you've downloaded the above files, we'll go through the steps to make the DD40X do its stuff! UP's giant DDA40X works its way up a steep grade. We don't need to worry about the early ENG, CVF and sounds in dd40eng.zip and dd40mod.zip - these are superseded by the steps below. Let's start with you having installed the DDA40X with Auran's installer. You may have gone ahead and made Cabview and Sound sub-folders under the AURAN_DDUP folder and copied the GP38 cabview and sound files there. No matter - after we've installed the NALW DDA40X cabview and everything's working, these sub-folders can be deleted. So look forward to freeing up some disk space! The next job is to install the F45 cab by NALW (f45cab.zip) and the update (f45v11.zip). Extract the EXE file from f45cab.zip into your Installs folder (This should be a sub-folder under your Downloads folder. We set up Installs from which to run installer programs and then delete them after use because we've still got the original in a zip file in Downloads). Remember to virus check F45cab.exe, close any Windows program you may be working with, then choose Start -->Run, browse to the Installs folder and press OK to begin the installation. After the F45 cab is installed, use (Windows) Explorer to check that the F45 cab has been installed in its own sub-folder, F45, under Common.Cab, as is normal practice with NALW's designs. Now to dd40upgd.zip. Even though the filename has a suffix indicating an upgrade, it's an upgrade only if you used the earlier versions of NALW's ENGine and CabView Files. dd40upgd.zip contains an installer, so extract it to Installs, run your virus checker over it, close any running programs, and use Start -->Run to install. When finished, once again use (Windows) Explorer to go to the Common.Cab folder and look for a sub-folder called DD40X (or, Dd40x, after Windows has removed the capitalisation). You may wonder why put a cabview for a one-off loco in the Common.Cab folder. Well, it's a good cabview for any SD40-era loco with a wide cab and two-pane windscreen so if it's in Common.Cab, we know where to look. Leave Explorer open at the Dd40x folder and now open dda4011.zip. You'll see it's got a CVF file and an ACE file. Read the "readme" and you'll see that the only job is to copy these two files to Dd40x. Select the two files in WinZip, hold down the left mouse button and drag them onto the Dd40x folder you've got open in Explorer. When asked, answer yes to "Overwrite?". One last install is that of the SD40 sounds in emd40snd.zip, unless you've already installed these by hand from sd40snd2.zip, or the later EMD sounds sd_40_x.zip or sd_40_rx.zip. With Explorer, you'll see that these SD40 sounds are installed into a sub-folder called Emd_sd40 or SD_40_X in Common.Snd so you can use them for any EMD loco. Now everything is installed. Let's do the final step of a bit of editing of the ENGine file to use our new DDA40X cabview and the SD40 sounds. Oh, one last point. For those of you with only the tiny (tinny?) speakers fitted to most computer systems, go out and buy a sub-woofer such as a Yamaha for about $100 - the DDA40X deserves to be heard. A UP 1990's most powerful loco, an AC6000CW. Save auran_ddup.eng and exit WordPad. Using your favourite consist editor, i.e. ConBuilder, put a suitable load onto your DDA40X and get training. Once everything is going OK, you can come back with Explorer and delete the Cabview and Sound sub-folders under the Dd40x folder because we've aliased all the cabview and sound files to Common.Cab and Common.Snd.